The West Side and Ruthie’s Run will be groomed today. Mike’s Mile and Paradise Park are closed for avalanche danger. Please be safe. If we receive the high end of the forecast amount, dangerous avalanche conditions could develop and travel out Peanut Lake Road passed the Gronk will be discouraged. 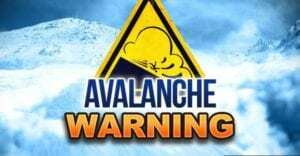 An Avalanche Warning is in effect for the Aspen, Grand Mesa, Gunnison, North San Juan and South San Juan zones. Heavy snowfall and strong winds overnight with more snow and wind expected today have created very dangerous avalanche conditions in these zones. Large and dangerous natural and human triggered avalanches are likely. Avalanches can be triggered from the bottom of the slope or from adjacent slopes and can break in surprising ways and run long distances. Travel in avalanche terrain is not recommended.